a terrific buzz to the store. We are only just starting to understand what it can bring to this amazing place. This is a wonderful opportunity to use our work area and meet some like minded people. Set up for the day and enjoy our cafe's many delights. Call the store on 03 4241 2109 to book your place. For group bookings of greater than 12 you can secure the space exclusively. 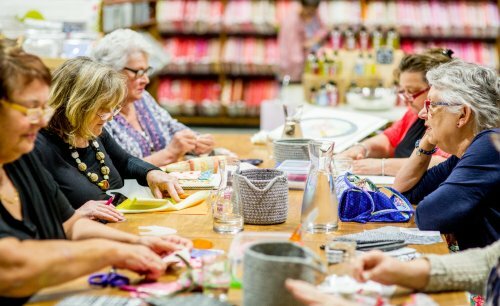 The workspace area seats up to 32 so why not consider a trip to Torquay when your craft group next meets? A weekend away dedicated to crafting is a rare indulgence these days. We can help design one for your group that will be remembered long after your visit. We can offer a range of specially designed workshops, organise catering throughout the day and in some cases into the evening. Or just use the workspace as your place to sew for the weekend. Speak to us about our preferred list of accommodation and what other delights Torquay has to offer. Torquay is a convenient 1 and half hours from Melbourne and a perfect destination for a day trip. 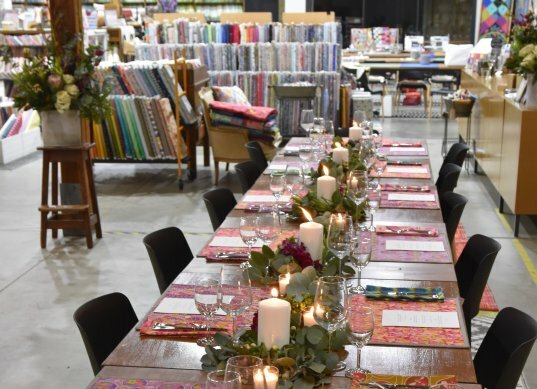 We can work with you to suit the needs of your group whether this be organising Morning Tea to be served as soon as you arrive or a light lunch before you peruse the aisles of gorgeous fabrics and notions. Consider product or technique demonstrations or a talk from our ever inspiring owner, Jen Kingwell. Does someone special have a birthday coming up or are you looking for the perfect venue for your end of year Craft group celebrations. We can't wait to hear from you and assist in creating a fabulous event.